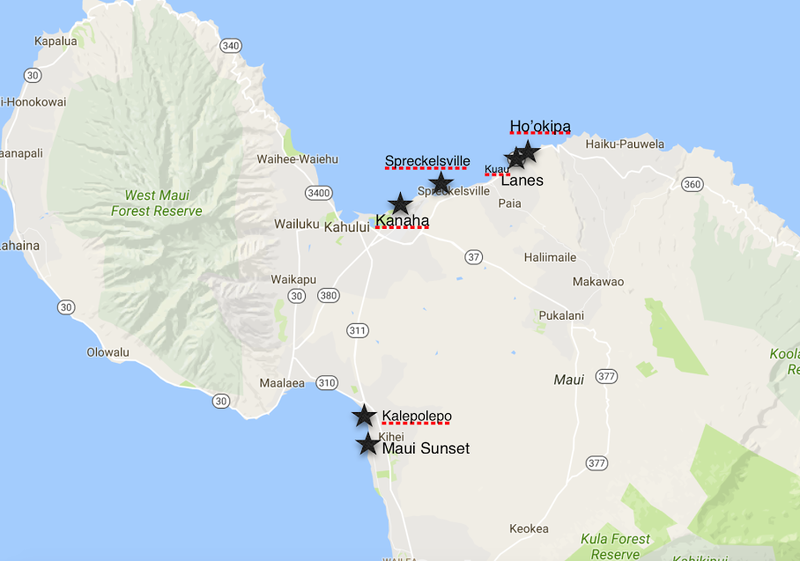 Now that we’ve covered where to stay on Maui to have the best windsurfing or kiting vacation, here are our favorite beaches to visit! We have ranked them for difficulty and included what they’re best known for. The swell combined with the jagged shoreline is not to be messed with. That being said, if you are a confident and skilled windsurfer, and understand how Ho’okipa operates, this is one of the best spots in the world. The winter offers bigger swells and is the spot to watch the world’s best soar off waves and flip around effortlessly. One important note: kiters are not allowed to launch here. If you are a kiter, you’ll need to launch at Lanes and make your way up to Ho’okipa. If there are more than 10 windsurfers and/or surfers at Ho’okipa, then you aren’t allowed to kite there. Kanaha is probably the most well known beach to tourists looking for a windsurfing or kiting vacation, or to those that just wants a day or two out on the water amidst their relaxing family vacation. “Uppers” is in the bay at the top of the park and features big waves. “Lowers” has a smaller, more consistent break closer to the inside, so it’s a great place to start your wave sailing. One downside to Kanaha’s popularity is there will be tons of other sailors to watch out for! Spreckelsville (“Specks”) is a fantastic beach for those that want less hustle and bustle than you may experience when sailing at Kanaha. The road that you use to access the beach, called Stable road, is extremely bumpy and rough. The swell can be a bit choppy, but the waves off to the right of the beach are fantastic for intermediate wave sailors. One important note: kiters are not allowed to sail here because it’s within the fly zone of the airport. This is also a more advanced location, as it sits right between Mama’s Beach and Ho’okipa and brings in a fairly large and choppy swell. Windsurfers typically don’t sail here, as the launch point consists of jagged coral. Advanced kiters flock here when the wind and waves pick up because it is the closest kiting launch site to Ho’okipa and is one of the most advanced kiting locations in Maui. All skill levels can sail and kite in North Kihei. The beach is in a bay where the water is way more calm than the North Shore, which is good for windsurfers looking to work on their jibes. A short way down the road is Maui Sunset, a beach with a short wave break. One important note is that it’s not typically windy enough here, especially for windsurfers. Only when a Kona wind comes in does the wind whip through.